Why didn't we make nut butters in science class? Before turning to hazelnut praline, though, I wanted to reflect on the last year of blogging. There has been another new header (the fourth since the site started) and 175 new blog posts, taking the total to nearly 550. Amusing search terms from the last 12 months include cauliflower smoothie (even I have never gone there), body attack injuries (I have been there), things that scare me funny (never mind funny, I just get scared), and vegetable funny image (?!). Last but not least in the reflection stakes, there is the fact that I still enjoy blogging. It doesn't matter if I am busy or relaxed, tired or energetic, sad or happy, or irritable or content - I am grateful for it. I am also grateful for all of you! The blogging community is a lovely one, and I get a lot of pleasure from your comments, and for those of you who also blog, your own posts. So, without further ado, let's celebrate with chocolate. Hazelnut praline chocolate, to be specific. When making these, I had the notion of making vegan, homemade Guylian Seashell chocolates. As it turns out, the praline is more like the smooth filling component of a Ferrero Rocher. It's not a bad dilemma to be faced with, chocolate that taste like Ferrero Rocher instead of Guylian. In fact, it's not really a dilemma at all. It's lovely and wonderful and shut-your-eyes-this-tastes-like-heaven. At the risk of sounding conceited, these chocolates are quite wonderful. They are by far the best of my homemade chocolates to date. What is more, the recipe makes enough praline filling for 12 or so chocolates, and another cup of chocolate hazelnut spread for you to use in whatever form you like. I warn you, though: once you've tried it, Nutella will look like a scruffy pair of jeans next to a little black dress. Again, perhaps not such a bad dilemma. Preheat your oven to 180'C and line two baking trays with baking paper. Layer the hazelnuts over the baking trays and roast for 8 to 10 minutes. While the hazelnuts are roasting, melt the coconut oil if it isn't already liquid and then combine with the cacao / cocoa and agave / rice malt syrup. Melt over very low heat or on low power in the microwave until smooth. Use one-third to one-half of the chocolate mixture to coat the lower half of your silicon moulds, or the bottom of muffin liners. Transfer to the freezer for 30 minutes to firm up. When the hazelnuts are roasted, use paper towels to rub the exterior and remove the skins. Don't worry if some skins remain, but aim to remove as many as possible. 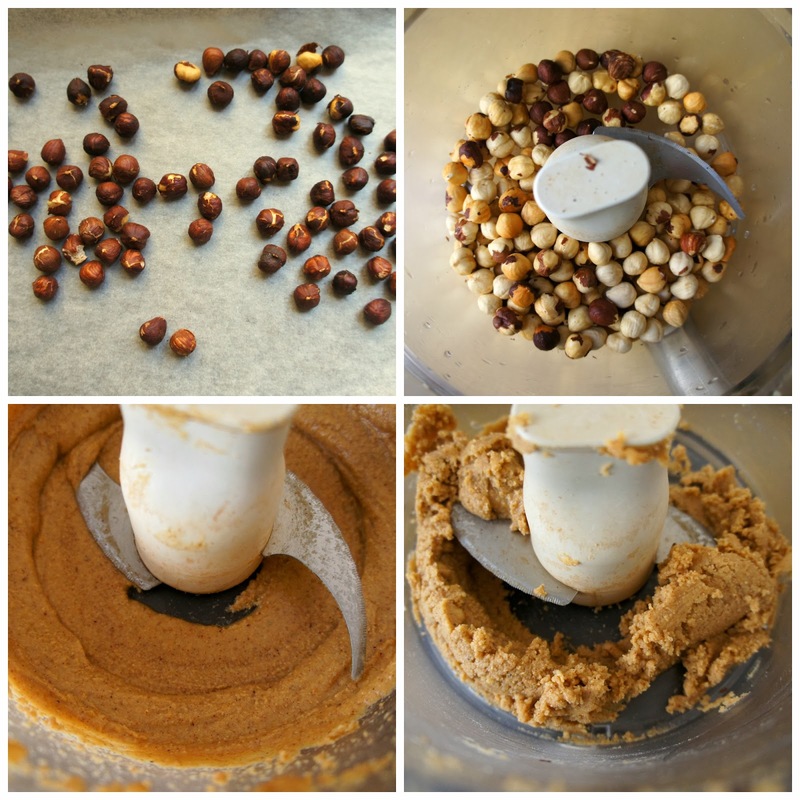 Transfer the shelled roasted hazelnuts to a food processor and process for 5 minutes, until the mixture is smooth and starting to clump together (see image above). Scrape down the sides of the bowl and process for another 5 minutes, or as long as needed to get perfectly smooth and silky hazelnut butter (again, see image above). Add the agave / rice malt syrup, almond milk, cacao / cocoa, vanilla and sea salt to the hazelnut mixture and process until incorporated and smooth, approximately 1 minute. When ready, remove the chocolate moulds from the freezer. Spoon 1/2 to 1 tsp of hazelnut praline over each chocolate base. Reheat the chocolate coating if it has firmed up, and then spoon over the chocolate base and hazelnut praline filling, to cover the filling fully. Return the chocolates to the freezer or fridge to set, allowing 4 hours setting time if using the fridge. When set, turn the chocolates out from their moulds and enjoy. Store the chocolates and leftover hazelnut praline in the fridge. You might be tempted to skip the roasting and peeling of the hazelnuts, but it really helps get the praline perfectly smooth. It is worth the time, I promise! If you feel like investing extra time, you could also swap the chocolate coating for a more authentic chocolate involving cacao butter instead of coconut oil. My recipe from last year's anniversary would work well, otherwise Celia has an excellent guide to chocolate tempering using a store-bought chocolate base. Thank you Johanna, and if you give your processor enough time (and yes, roast and peel the nuts!) then it might get there? I suspect my 10 minutes would be less for people with super powerful machines. 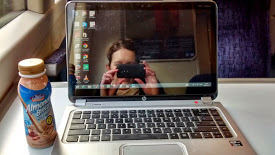 Thanks Janet, and yes, it is quite odd to reflect on blogging for an extended period! What did we used to do with all the time?! This looks delicious. Oh that praline...nom! I smiled when I saw your anniversary just the other week - as you say, a good time to start blogging! These pralines look amazing though I've seriously overdone the chocolate today so I'll have to look again at the recipe tomorrow when I'm out of the chocolate coma! P.S. There' a chocolate cauliflower smoothie in Julie Morris' book "Superfood Smoothies" which I've heard is very good. I know the feeling of too much chocolate but luckily a new day usually brings a renewed love ;) I hope you enjoy these if you do end up getting to them. Thank you so much Kate - that is a really lovely comment! Happy blog birthday!! Three years is quite a long time!! I love your "raw" tradition. I think that, to me, really is more like food science than just about anything else! These chocolates look divine. I'm all for chocolate and hazelnuts together all the time! Food science is spot on :) Why didn't I go into food science instead of my area of research?! Congratulations on 3 years blogging! These chocolates look devine and are a fitting way to mark the occasion. Congratulations on your blog anniversary! Kari, I'm so thankful that we connected! You're one of my favorite blogger, and you always open my eyes to unique and delicious recipes! Blogging community is great, isn't it? It holds a special place in my heart. Ferrero Rocher is one of my favs! It's certainly not a bad dilemma to have ;). Happy 3 years! These chocolates look rich and delicious! What a great way to celebrate the ocassion. :) I wish you many more years of happy blogging! Woot! Three years and still holding the passion and energy is an achievement! Well done! Well, some days are more energetic than others ;) Thanks! ...and what a delicious way to celebrate YUM! Congratulations on making it to the 3 year mark. That's an incredible achievement! I'm so happy to have found you in blogging world ♥ Your posts are always a joy to read! These chocolates sound totally scrumptious! I used to love Guylian and Ferrero Rocher, so I cannot wait to give these a try! I love chocolates. thanks for sharing this delicious chocolates. Wow these look fantastic! Just shared the link on my fb page and pinned it- yum! Congrats on 3 years of blogging!! Hezelnut is one of the most umpressive options for the sweets. I like to have the perfect vegan chocolate suppliers at my list for the same. I simply like to have the best chocolates in the my dish now.